Tiger Woods shot a 2-under 70 on Saturday in the third round of the Farmers Insurance Open despite only hitting three fairways and nine greens over 18 holes. It was Woods' third straight round in the 70s at this event, and it got him to 3 under for the tournament, which moved him inside the top 40 at the time he finished. Woods once again looked pain free (a win these days) but certainly made the rest of us wince with some of the tee shots he was hitting. He scrambled like a mad man, though, and had a putt for 69 on the final hole. "It was gross," Woods told Dottie Pepper of CBS about his round. "Fighting and grinding. I tried as hard as I possibly could out there. I didn't have much. I fought and put up a score and made some putts. My feels are all off. They're all different now. I feel different than I did in the Bahamas." Here are five takeaways from Woods' third round. 1. Driver was all over the yard: Woods could not have hit fewer fairways if he'd dropped balls randomly out of the blimp hovering over Torrey Pines during the third round. After hitting just 3-of-14 fairways in Round 2, he pulled that feat off again on Saturday. That's 6 of his last 28 fairways. He only lost half a stroke to the field in that category because he was pretty long off the tee, but his misses were cringe-worthy. He'll have to right that ship at least a little bit to get into real contention at an event this season. The part of his game that's not being talked about as much (but maybe should be) is that he's been rather lousy with his approach shots this week. He's mentioned it throughout, but he's currently 69th in the field in strokes gained on approach shots, mostly because he seems unable to work the ball either way. That's not good! 2. The Scotty Cameron was hot: Coming into the week, I thought it would be his flat stick that contained more rust than his swing. I was wrong about that. He got up and down seven (!) times on Saturday and gained nearly four (!) strokes on the field on the greens. That's the Tiger template of old, but the problem (as mentioned above) is that he's hitting it nowhere close to how old Tiger used to hit it. 3. Creativity lives: On the par-4 16th hole, Woods yanked one all the way out to the left and had no chance at the green. Except that, well, he's Tiger Woods. Stuck behind a tree, Woods hit a 40-yard cut into a green-side bunker. Up and down from there, and it's a 4 on the scorecard. From where we were all sitting, though, it seemed as if Woods would have to punch out and try to get up and down from the fairway. His famous creativity, it seems, has gone nowhere. 4. 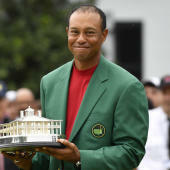 Realistic expectations: Normally apoplectic by any shot that didn't land in a 5-inch radius of where he wanted it to land, Woods actually seemed in good spirits on Saturday despite not having a clue off the tee. I don't know if he's simply reacting ironically (not out of the question) or he has more realistic expectations for himself than he used to, but it was good to see Woods give himself a lengthy runway on which to get this thing off the ground. The long game for Tiger is not a four-round event but rather a four-year plan. There's a difference between fundamentally understanding that on a macro level and acknowledging it in the moment. He seemed capable of doing the latter on Saturday. 5. Backdoor top 10? Incredibly, after all of this, Woods has a chance for a backdoor top 10 finish on Sunday. He's just inside the top 40 after three rounds and could sneak into the top 10 with a really low one on Sunday. He's currently five back of golfers inside the top 10. It was amazing to see the throngs that scurried out to watch him en masse on Saturday, and you know they'll be back for more on Sunday. All in all, Woods' latest comeback remains about as successful as it could possibly be through 54 holes. This would be just the fourth time since Tiger's last win ('13 Bridgestone) that he recorded 3 rounds of par or better to begin a tournament.